Tour the paintings and walk through four exhibitions. Randy Johnson's paintings are pure abstractions  compositional gems found within larger fields of seemingly chaotic disorder. "While the images are clearly ethereal, they also reveal stunningly familiar patterns that mimic the underlying structural essence of life forms and natural phenomena." 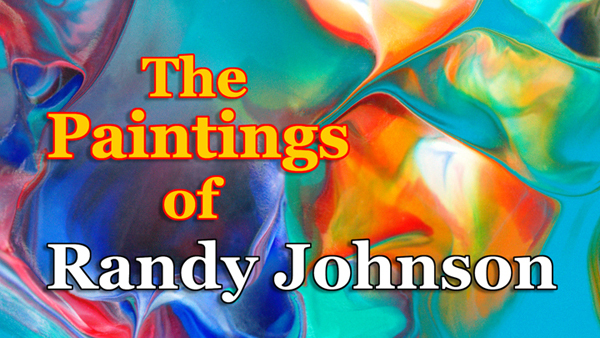 "Our artist for March, Randy Johnson, is in all ways a contemporary artist, and his images are pure abstraction. They are also often very sensuously beautiful as he seems to prefer great swirling movement in rich, high-value, warm colors, sometimes contrasting with mysterious blues and odd shots of high intensity red. The variety of feelings he creates is testament to the ability of the abstracts to change mood. Randy is also a totally contemporary craftsman, mastering technologies just recently created." Digital print on canvas • 27" x 15"